I have had the joy and luxury of being able to put in a garden this year and tend it from germination through to a clamoring jungle of vegetable being. Because it is in raised beds and because it is organic, I managed all my weeds by picking each, one by one. Next year I am going to lay down plastic to help with weed but more importantly water management. Neither of these things have been too onerous, its just nice to optimize the system. As a result of the daily weeding and now the daily tending of my high rise cucumbers, spaghetti squash, zucchini, pumpkins, and watermelons, I have come to feel rather maternal towards these plants. As they shift from the growing phase to the production phase, I am having to deal with the twinge I feel when I harvest a vegetable. In some ways its not about empathy toward the plant, after all harvesting doesn’t mean killing the plant, I am just removing one of the fruiting bodies which have evolved to disperse the seed. I, in my own monkey ways, am serving the plant. No, its more about how I have come to feel about the garden as a whole and each relatively integrated component. I have spent so much time with each and every plant that I imbue each fruit or vegetable with this aura of increased value. It is almost unbearable to think that this thing, this vegetable, which I have spent so much time getting to grow will be eaten in a few short bites. Sure, the legacy of each bite is exactly the objective of the garden – the healthy organically fed bodies of my children. Each vegetable will not only feed their bodies but also their minds as I expand their experience with new vegetables that are substantially more fresh than anything we buy in the store. It remains unbearable on some existential level, a dark quiet one that is too much ego and needs to get over it’s self. When I was picking a few early beets, I was flooded by all of this. I wasn’t ready for the intensity of the local, backyard gift of nature. The only honest way I know how to honor the work I have done and the struggle each plant had to live and thrive is to serve these vegetables to my family in the freshest and most authentic or creative way I can so that they can “get it” too. We will celebrate the bounty of the harvest, that gift of co-evolution, with each bite. Mindful eating of mindfully grown foods, intense man. 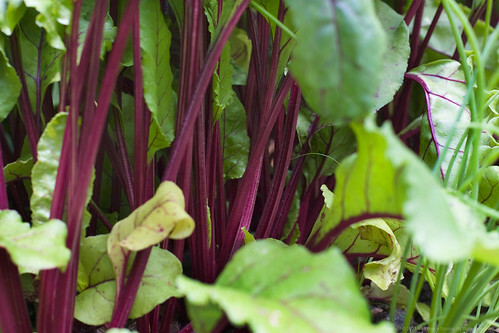 Rinse dirt off beets, cut off greens, leaving some stem so that you are not cutting right next to the beet root and also leaving on the tap root. 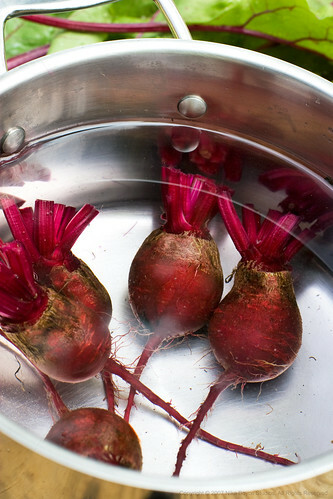 Scrub all dirt off the beets and put in water that comes to a simmer (not massive rolling boil) and cook until just tender. Meanwhile, separate the stems from the greens, rinse the greens again and put in a zip-lock bag with a moist paper towel and into the fridge. Dice the stems into 1/4 inch bits and put into the water for the polenta. Simmer the diced stems for 15 minutes or so to extract as much flavor and color as possible. Add lemon juice at the end of this simmer. Make your polenta with this water as per the package directions. I did the instant 3 minute stove type polenta. 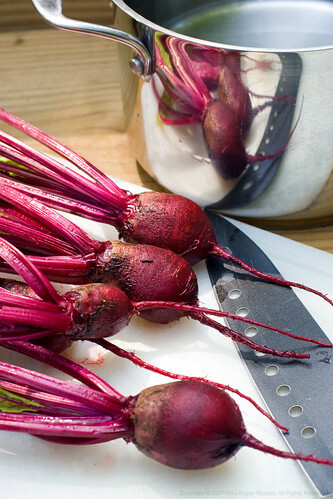 If you do a really long recipe you may lose the red color of your beet water. Roll greens up into a “cigar” and slice to make thin spirals of greens. Put oils in medium heat saute pan, add greens and then the garlic. Saute until wilted. Make the beet, garlic vinegar, and apricot gastrique (recipe below). 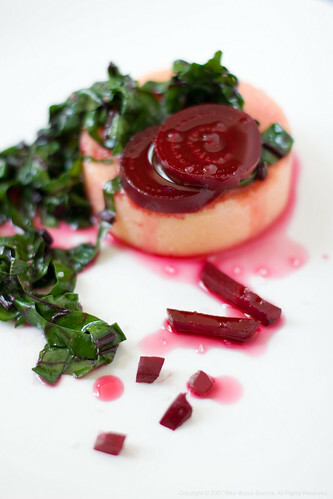 Slice one or two beets (or all three, up to you), layer on polenta round, add wilted greens and then dribble with gastrique. Sprinkle with sea salt, to taste. Add the beet water and jam to a medium hot saute pan. Incorporate the jam into the beet water and reduce by about a quarter. Add the vinegar and then allow to reduce slightly more. This will not thicken but you do want it to not be mostly a watery concoction. Very beautiful dish. And the way you grew your beets is impressive too! Kalyn: hey, the beets grew themselves! I just arranged them in rows and gave them some water. I am intensely envious of your garden, Nika, and tagging along on yor adventures over at Humble Garden, too. And I agree with you, even if mine are only herbs, there’s just something really, really special about them being your own little babies. Savour every bite! Zarah: I love your blog! Glad to have met you, thanks so much for leaving a comment. I am glad to know you are reading over at HG, a new blog can feel sorta lonely RE: Your herbs that are looking funky .. I was wondering if you are watering them with chlorinated city water? I have found that container gardening is so much HARDER than working in the ground or in the really big raised beds we made. Will be watching to see how it turns out for you! Your garden has come out beautifully! All that hard work has paid off! I have a question about the recipe above. When you simmer the beet stems in the water for the polenta, do you leave them in or strain them out before you add the polenta? 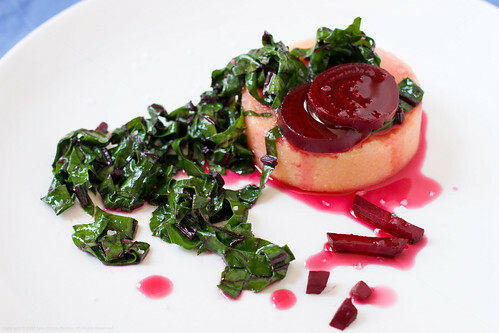 It looks divine, I can’t wait to try it – I love beets but have never used the greens before. I have had a hard year in my garden, living in southern California where we have had only 2.3 inches of rain this year. But I have learned so many lessons and gained so much knowledge that it has been anything but a wasted year! I have been making copious notes of my mistakes and learning what I should do from blogs like yours as well. Next year drip systems! Ingrid: Sorry I left that out! Yes, strain the stems out. I used cheesecloth because there was also some sand or dirt at the bottom of the pot from the stems. I think there MANY people have been having a hard time in SoCal re: water and gardening (and life! ), so sorry to hear it! I think we had 2.3 inches in the afternoon two days ago. My climate is definitely different than yours. Where you have to worry about too little water and heat we have to worry about too much water and cool or down right freezing temps. Drip irrigating is definitely a good way to go. I suggest also doing ollas (buried unglazed terra cotta jugs) to do an even better job. Here is some info on the olla concept (found at this link http://cals.arizona.edu/cochise/mg/pdf/Apr05.pdf this is a PDF). “Irrigation of plants by means of ollas, unglazed pottery jars, is an ancient practice. It was brought to the American Southwest by Spanish settlers and adapted to local gardens by Native American gardeners as well as by the Spanish settlers. Over time, modern irrigation systems were adopted, but these modern systems are not as efficient as irrigation by seepage from buried ollas. Modern systems, even surface drip irrigation systems loose more water to evaporation and more likely to clog than ollas. When ollas are used properly, plant roots will proliferate around the moist clay jar, intercepting water before it can move through the soil by capillary action. This water intercepted by plant roots will then be used in the plant transpiration stream. This results in almost 100% of applied irrigation water being absorbed by the plants. Proper plant and olla selection is important. Woody plants may break the pottery jars as their woody roots grow in diameter. Herbaceous plants are less likely to damage ollas. Olla porosity, size, and shape must be matched to plant water needs, root size and root distribution. Deeply rooted plants benefit from deeper ollas, shallow rooted plants are more efficiently irrigated with shallow ollas. The diameter of the olla may also be chosen to match the diameter of the plant cluster. Shallow, broad, ollas will provide adequate irrigation for clumps of grasses and annuals, Olla plantings should be planted in clusters to maximize water use efficiency. While the planting group may be of one plant type, mixtures of grasses, annuals, biennials, and perennials may also be planted around a single buried olla. Mixtures of plant types may be used to create a more natural landscape. The olla clusters may themselves be clustered to create more expansive or linear plantings. The olla pottery may become a decorative element in the landscape along with large rocks and flagstones. Portions of olla left exposed above ground should be treated to prevent evaporation. To modernize these ancient irrigation systems, the jars may be recharged by a drip irrigation system, timed and sized to replace water lost from the ollas. Recharge of ollas may be done daily, or as frequently as allowed by water conservation ordinances. Some gardeners make ollas from plastic bottles pierced by pin holes to allow slow leakage of water. When buried near the plants to be irrigated they serve well as ollas, however, the plastic breaks down quickly if exposed to sunlight and should be covered with flagstone or other material to protect from sunlight. Remember to not use city water as it is chlorinated and has other chemicals. Do NOT use distilled either, especially right on the plant. You cant use rain barrels because, well, you dont really GET rain. I can see only one way of getting non-chlorinated water, use a filtration system. That can be expensive too! I am sure that there are gardening groups in your area that have found clever ways to deal with this. If I could send you all some rain I would! What a gorgeous harvest! I need to get a yard. Next year, I’m going to start the garden. Your post makes me so happy – and I’m not even thinking about the eating or tasting part – just the gardening, growing and nuturing. Lisa: indeed! Container gardening is possible too, tho it can be tricky. Any chance you can find some community gardens near you in the concrete jungle? Steamy: awww, your comment warms my heart You totally get what I mean.